Flow-induced alignment in composite materials: Current applications and future prospects; Fiber-fiber and fiber-wall interactions during the flow of non-dilute suspensions; Macroscopic modelling of the evolution of fiber orientation during flow; Flow-induced alignment in injection moulding of fiber-reinforced polymer composites; Control and manipulation of fiber orientation in large-scale processing; Theory and simulation of shear flow-induced microstructure in liquid crystalline polymers; Mesostructural characterisation of aligned fiber composites; Materials property modelling and design of short fiber composites; Micromechanical modelling in aligned-fiber composites: Prediction of stiffness and permeability using the boundary method. The purpose of aligning short fibres in a fibre-reinforced material is to improve the mechanical properties of the resulting composite. Aligning the fibres, generally in a preferred direction, allows them to contribute as much as possible to reinforcing the material. 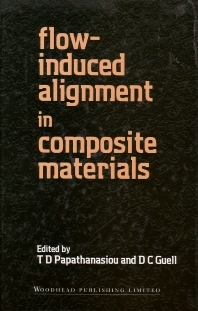 Flow induced alignment in composite materials details, in a single volume, the science, processing, applications, characterisation and properties of composite materials reinforced with short fibres that have been orientated in a preferred direction by flows arising during processing. The topics discussed include fibre alignment and materials rheology; processes that can produce fibre alignment in polymeric, liquid crystal polymeric, and metallic composites; materials characterization and mechanical properties; and modelling of processes and materials properties. The technology of fibre-reinforced composites is continually evolving and this book provides timely and much needed information about this important class of engineering materials. The bookis an essential reference work for industry and an indispensable guide for the research worker, advanced student and materials scientist. Dr T. D.Papathanasiou obtained his engineering diploma from the National technical University of Athens and his PhD in chemical engineering from McGill University. Between 1992 and 1997 he was Unilever Lecturer in Chemical Engineering at Imperial College, London and he is currently Associate professor at the University of South Carolina, USA. Dr D. C. Geull received his BS in chemical engineering from Iowa State University and his MS and PhD in chemical engineering from MIT. He was then awarded a Director's Post-Doctoral Fellowship at Los Alamos National laboratory and later accepted a position as a technical staff member there.